As part of its ongoing attempts to make its business-oriented network more social, LinkedIn launched an open plugin platform on Wednesday that looks and sounds very much like the “open graph” platform Facebook launched last year with much fanfare. 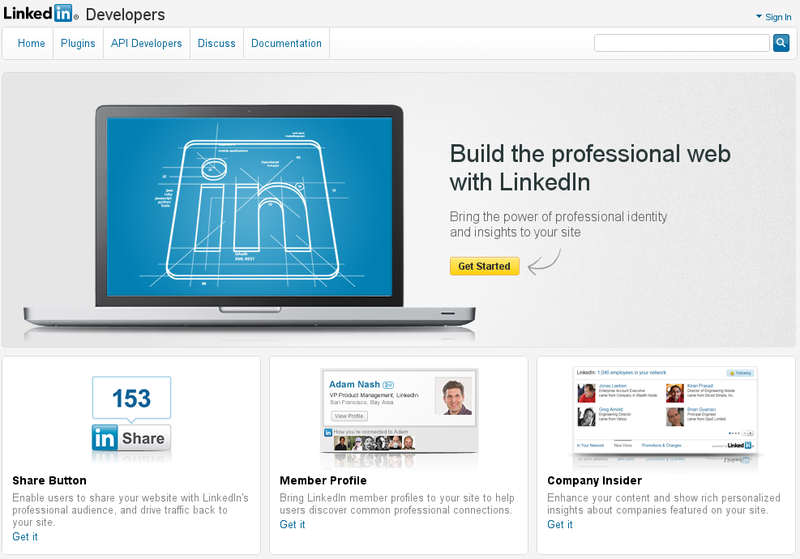 Like Facebook’s offering, LinkedIn now allows developers and website publishers to add various features from the network as widgets or plugins on their pages, so that users can connect their activity to the LinkedIn network. More than any of its previous moves, this one throws LinkedIn into head-to-head competition with Facebook for the clicks and identities of web users. LinkedIn has had a form of “open API” or programming interface since 2009, but never seemed to generate a lot of traction with it, and there have been ongoing complaints from developers about the difficulties and restrictions involved in working with the company’s APIs. This latest effort is a lot more ambitious, since it involves full support for OAuth, the open authentication standard that allows services such as Facebook to identify users remotely when they interact with other websites. The company has launched a series of social features over the past year or so, most of which have seemed like carbon copies of similar features offered by Twitter and Facebook. Users can follow others on Twitter and see updates? They can do that on LinkedIn too. Friends can “like” items on Facebook? They can do that on LinkedIn too. The business-networking site also launched Twitter integration, so that feeds or streams can show up on LinkedIn pages, and more recently added a “social news” feature called LinkedIn Today that shows the top most-shared news from your network. So what happens now, when LinkedIn tries to go up against Facebook as a login ID, profile and “share” button provider for the broader web? To some extent, there is very little overlap between the two networks, since one is primarily seen as personal and the other as professional — although some services such as BranchOut have been trying to bridge that gap by adding a professional layer to Facebook, and the latter seems to be trying to reach out more to businesses and brands as part of its monetization strategy. But Facebook still seems to be a social playground for many users — a place they post photos and play games and share links to funny videos — while LinkedIn is like the office: it’s where users post their professional histories and connect with others in their field, search for jobs, and do other business-related things. So is there room for both to have a web-embracing plugin platform? 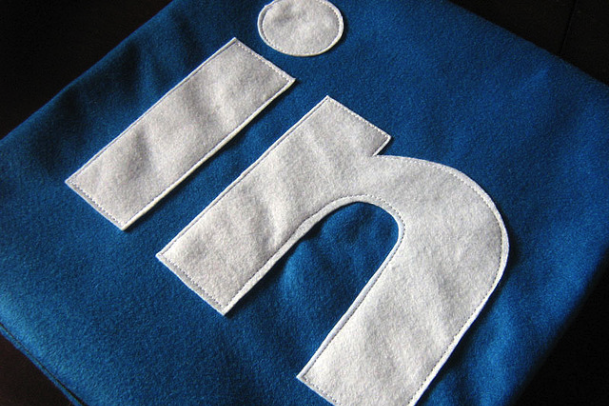 Could LinkedIn appeal to older, more professional users who think Facebook is either too frivolous or too insecure and therefore don’t login or use its plugins? That’s likely what LinkedIn is hoping for. There isn’t anything wrong with taking inspiration from other sites and services, of course — especially when you are in the process of going public, as LinkedIn is, and trying to add as much value as you can to your business. Social networking is where it’s at, and the company clearly wants to become the Facebook for your professional life. Adopting the kind of “embrace and extend” approach that Facebook did with its open-graph APIs and plugins seems like a smart way to go, rather than just trying to be a destination. But the question remains: will anyone use them? I do not see why there is not room for both, I use both. But I must say when it comes to work LinkedIn is by far my choice. If I could see the info in Facebook as well, now that could be powerful. will give you the whole picture of that person when conducting business…. so will it happen? I don’t think it will happen that you will see both. Similar to how I might have a weekend camping trip with friends from high school or my current neighborhood that I wouldn’t want to take with my professional colleagues, I might want to spend leisure time with a different set of friends than work time with colleagues. There are always some cross-over of social and professional networks, but rarely are they the same complete sets. I think this is why both Eric Schmidt and Mark Zuckerberg are wrong – what we do in different circles doesn’t necessarily need to be constantly available to all circles. That doesn’t mean it’s two sets of identities, or disingenuous, it just means our lives have different segments that involve different people and different activities. I guarantee my work colleagues don’t care about my wine tasting blog unless they are also wine afficianados. It’s available online but rarely does anyone at work mention it, and if they do it’s for a wine recommendation. That blog pushes to Facebook, where I have friends who do like wine tasting, but not to LinkedIn, where I don’t. And my wine tasting notes on CellarTracker push to Twitter where I have a blend of interest areas and people I follow and who follow me. Interesting post. I think there is more to the story. Linked, Plaxo, Facebook and like have built compelling new models because they removed the “friction” from establishing online relationship between individuals. Facebook took it to the next step with “open graph” and now LinkedIn is deploying its next evolution of how these relationships can be leveraged. Whats interesting is that no one has removed any “friction” from actual business relationships. Corporate development and the “friction” to create actual business relationships of import has not been tackled by anyone. I think that corporate relationships will undergo some major changes and the “business graph” is created. LinkedIn is well situated to do this. In full disclosure – we are working on just this opportunity. Gregg Freishtat, CEO Vertical Acuity. Couldn’t imagine NOT being LINKED!!!!! Having two identities? Don’t you know what Zuckerberg says about that? I thought not protecting the privacy of those who pay your bills represented a lack of integrity. Thanks for clearing that up for me, Zuck. I wish that #LI would improve it’s current ‘user experience’ before going on flights of fancy – there are so many existing problems with functionality of it’s Groups it beggars belief! They appear to be neglecting the basics – excel at what is currently offered, then move on. This, too, sounds exactly like Facebook. Exactly James. I appreciate the distinction. With Facebook, I can ‘connect’ with the people I went to elementary school, the obligatory parent relationships I have at my kid’s school, and the many who I know I know, and have to know, but don’t really want to ‘know’, if you know what I mean. On LinkedIN in contrast, I cultivate and manage my professional identity. This does not involve lending one of my contacts some nails to build a virtual farmhouse, but instead the activities on LinkedIN may someday result in business opportunity. Not only is there rom for both, I’ll use both exactly for that separation. I use Facebook for mostly personal but some professional, and Twitter more for professional interest and gathering info. Social plugins from LinkedIn will allow serendipitous discovery of professional tools, articles, networks, and more that only twitter has done before for me. It will promote more loose ties that benefit professionals in their settings. Very good in my view. Well said. Sums up my thoughts exactly.